This artist's still shows how NASA's Curiosity rover will communicate with Earth using two different types of radio signals during its Aug. 5, 2012 landing. PASADENA, Calif. — NASA's next Mars rover is just hours away from its harrowing Red Planet touchdown, an unprecedented landing attempt that is leaving some of its handlers "emotionally terrified." The 1-ton Mars rover Curiosity is due to touch down inside Mars' huge Gale Crater by 10:31 p.m. PDT tonight (Aug. 5; 1:31 a.m. EDT and 0531 GMT on Aug. 6). While the mission team has been guiding and checking up on Curiosity throughout its eight-month space cruise, the rover must tackle the punishing trip through Mars' atmosphere more or less unaided. "She's kind of on her own now," Adam Steltzner, of NASA's Jet Propulsion Labortatory, said during a press briefing here at JPL today. Steltzner is entry, descent and landing (EDL) phase lead for Curiosity's $2.5 billion mission, which is known as the Mars Science Laboratory. Because of the 14 minutes it takes signals to reach Earth from Mars, Curiosity should actually land on the Red Planet at 10:17 p.m. PDT (1:17 a.m. EDT, 0517 GMT), NASA has said. That means the earliest NASA (and the rest of the world) will know if the rover landed successfully or not is 10:31 p.m. PDT. Curiosity will attempt a move tonight that's never been tried before on another world. A rocket-powered sky crane will lower the rover to the Martian surface on cables, capping an EDL sequence that NASA officials have dubbed "seven minutes of terror." The maneuver has performed well in simulations, and the team thinks that it will work. Still, there's no escaping the anxiety attending a planetary landing, especially one as complicated and intricate as Curiosity's. "We are rationally confident, emotionally terrified and ready for EDL," Steltzner said. Curiosity won't be able to send news of the landing's success or failure directly to Earth, at least not for a while. That's because Mars' rotation will take the rover out of contact with our planet in the middle of its descent through the atmosphere. However, NASA is hoping for a real-time update from its Mars Odyssey spacecraft, which will be overhead through the entire sequence. 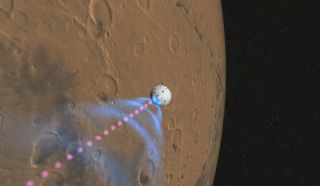 NASA's Mars Reconnaissance Orbiter and the European Space Agency's Mars Express spacecraft will also be watching, but they can only send data on after storing it onboard for several hours. So their updates won't come in for a while. Curiosity's drop zone, the vast Gale crater, is a 96-mile wide (154-kilometer) crater with a central peak that rises 3 miles up (5 km) from the crater floor. If all goes well, Curiosity's six wheels will touch gently down in the red dirt, and the sky crane will fly off to crash-land intentionally a safe distance away. Then the rover will go through a series of instrument checkouts to prepare it for its mission, which seeks to determine if the Gale Crater area can, or ever could, support microbial life. NASA launched the Curiosity mission in November 2011 and the rover has traveled 350 million miles in the last eight months to reach the Red Planet. Actually landing on Mars is the last major hurdle remaining for the rover, and NASA officials are keeping their fingers crossed. "So, tonight's it — Super Bowl of planetary exploration," said Doug McCuistion, the head of NASA's Mars Exploration Program. "One-yard line, one play left. That play's about 12 hours from now." NASA Television will broadcast live coverage of Curiosity's landing on Aug. 5 beginning at 8 p.m. PDT (11 p.m. EDT; 0300 GMT Aug. 6). You can watch NASA's live webcast on SPACE.com by clicking here. Visit SPACE.com for complete coverage of NASA's Mars rover landing. Follow senior writer Mike Wall on Twitter @michaeldwall or SPACE.com @Spacedotcom. We're also on Facebook and Google+.